Chital are attractive spotted deer ranging from golden to rufous in colour. They are strongly sexually dimorphic: males are much larger than females and grow large, lyre-shaped antlers. They have white fur on their abdomen, rump, throat, ears and on the inner side of their tails. Chital form small matriarchal herds comprising an adult female with her offspring of the previous and present year, herds of male bachelors and breeding herds of females with juveniles. Breeding occurs throughout the year, with peaks after the rutting season which varies geographically. Males with hard antlers are dominant over those in velvet or without antlers, and engage in a variety of mating displays, including rearing up and thrashing vegetation with forelegs, rubbing or hitting antlers on bushes, giving coarse bellows and sparring. 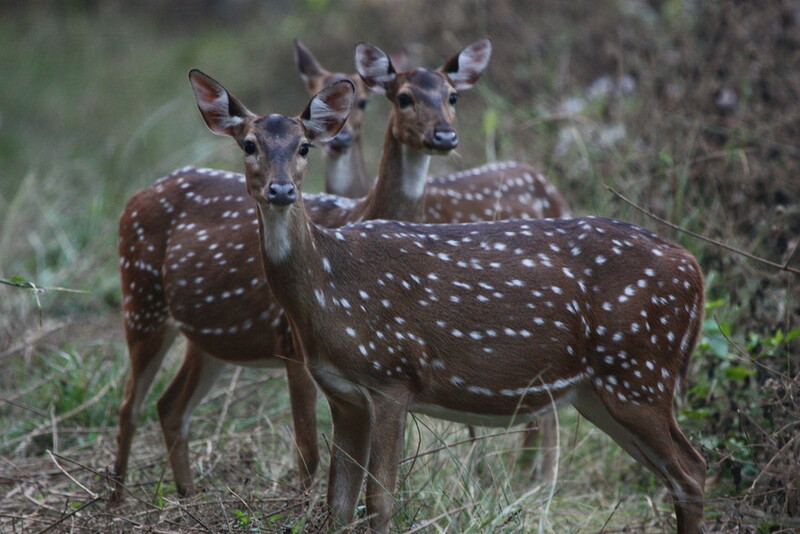 Chital often occur in the company of Common Myna, Sambar and Grey Langurs. They have a commensual relationship with the Common Myna, a common bird belonging to the starling family, who benefit from the insects disturbed by browsing deer. 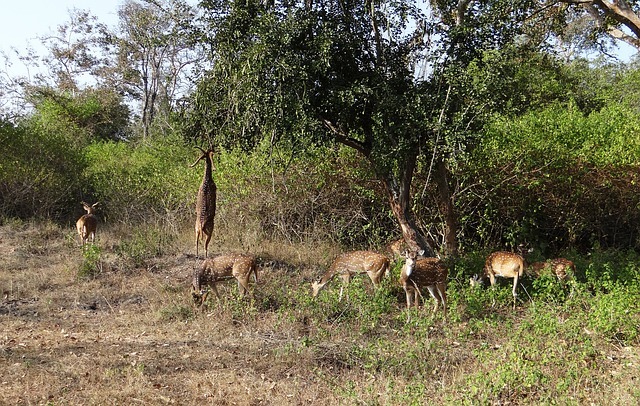 The relationship with Sambar and Grey Langurs is more mutualistic, as both species benefit from the extra vigilance of larger numbers and will both react to alarm calls of the other species. From their high vantage points, Grey Langurs make good sentinels, and chital also benefit from food dropped or dislodged by the foraging monkeys. Chital feed on both grasses and shrubs, which mean they find plenty of suitable habitats in their native countries of Bangladesh, Bhutan, India, Nepal and Sri Lanka. They were also historically introduced to Australia, Hawaii and Croatia, where they can still be found today. Although they are hunted in many areas for their meat, they are not subject to conservation concern as they are common over a wide range of habitats. However, they are an important prey species for several Endangered predators including Bengal Tigers, Dhole, and Asiatic Lions. Sharatchandra, H. C., & Gadgil, M. (1980). On the time-budget of different life-history stages of chital (Axis axis). J. Bombay Nat. Hist. Soc, 75, 949-960.